For sun enthusiasts Abu Dhabi offers not only year-round sunshine, superb beaches, and a clean, safe environment. Abu Dhabi continues to play host to visitors from all over the world, attracted by the culture and tradition. However, it is not only the impressive Corniche, exclusive hotels or the new cultural quarter on Saadiyat Island opens, with its Guggenheim, Zayed National Museum, Zaha Hadid Performing Arts Centre, and the recently opened Louvre Abu Dhabi that attracts travelers. For Arabian horse enthusiasts, Abu Dhabi and the whole United Arab Emirates with its fast-growing breeder's community are a must-see destination. The Emirates Arabian Horse Breeders Championship, held at the Abu Dhabi Equestrian Club, was the dynamic start to the exciting UAE show season 2017/18. This show was reserved for horses which haven't accomplished any championship so far; it was a good opportunity to meet some of the smaller stud farms in the fast-growing Arabian horse breeders and owners community. Smaller farms, as well as global players, presented their horses to an experienced board of judges: Doug Dahmen, Eric Gear, Mark Ismer, Ann Norden, Fausto Scanzi and Anna Stojanowska. Albidayer Stud, proudly owned by Sheikh Mohammed bin Saud Al Qasimi, Sharjah, enjoyed a fantastic success with some excellent young horses, managed by Dawn Martin and shown by Barry Shepherd. The FA El Rasheem son Rami Albidayer garnered Silver Champion Yearling Colt, bested only by FAM Al Khamis by D Mshary out of D Jareen, owned by Jamal Khamis Abdelrahman Murad Almaazmi. Bronze went to another FA El Rasheem son, A LR Alrasheed, owned by Yousif Mohamed Ali Mohamed AlRasheed. Albidayer Stud also won Silver Champion Junior Filly with Marwa Albidayer, by SMA Magic One out of Murooj Al Bidayer. Gold Champion Junior Filly, Manaret Babel, bred and owned by Babel Arabian Horse Stud, is out of an Albidayer bred mare: Munirah Albidayer and sired by AJ Barzan. Bronze Champion Junior Filly was given to Suhaila Alyah, by Moharid Al Khazna, owned by Alyah Arabian Horse Stud. Gold Champion Junior Colt Wahaj Albidayer is the new rising star of Albidayer Stud, a chestnut Versace son out of valuable Baila de Djoon. Moharid Al Khazna sired the Silver winning colt Kafo Alkhail, bred and owned by Jumaa Sultan Mohamed Jumaa AlMarzooqi and Al Aalya Arabian Horse Stud celebrated the Bronze winner, Saad Al Aalya, by BS Raeed. Last but not least, Albidayer Stud garnered another Gold Champion trophy: Salwa Albidayer, a wonderful grey Marwan Al Shaqab daughter out of San Jose Alfonsina, achieved the roses for the Senior Mares Championship. Rooh Aletehad, by AJ Portofino, achieved Silver for his proud owner Ibrahim Jasim Naser Mohamed Al Nuwais, while Bronze went to the lovely bay Marajj daughter Al Aryam Sama, bred and owned by Al Aryam Arabians. The collection of iconic mares and stallions which reside at Ajman Stud is the result of high intention and sincere effort between HH Sheikh Ammar Bin Humaid Al-Nuaima, crown prince of Ajman, and his team around Frank Spönle and Elisa Grassi. The bay FA El Rasheem daughter AJ Masari, out of AJ Marateb is a new jewel in the precious Ajman collection, winning Gold Champion Yearling Filly while her stablemate AJ Sahab, by AJ Mardan, garnered Bronze. Al Yazi BHM, a bay Marwan daughter, achieved Silver, bred and owned by Ali Ghanem Ali Humaila Al Mazrouie. With its exceptional group of horses, no one can discount last year's success of Bassam Al Saqran's Al Saqran Stud. 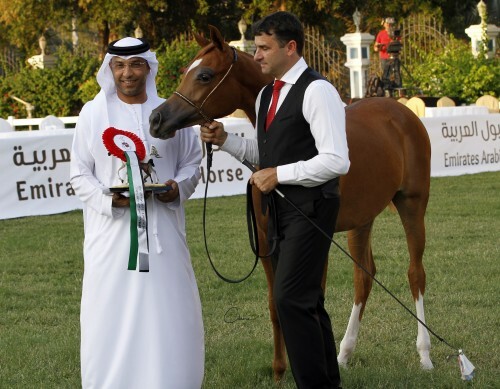 At the Emirates Championship, he presented his homebred Shanghai EA son SQ Burkan, out of LL Zamira, who accomplished Gold Champion Senior Stallion. Silver went to B A Ward, by Kanz Albidayer, bred and owned by Banat Al Reeh Arabian Horse Stud, and the Psyrasic son Jameh Al Haitham, owned by Haitham Mohamed Saeed Binfraush Alkindi, garnered Bronze. Our warmest "thank you" goes to the Emirates Arabian Horse Society for a great time at the Abu Dhabi Equestrian Club. The hospitality was much appreciated by everyone present. Also, a heartfelt "thank you" for cooperation with the Arabian Horse Global Network.